I have a confession to make, one that might seem odd for any American twenty-something: until viewing Skyfall, I had never seen a Bond movie all the way through. I've caught parts of movies on cable, played the GoldenEye video game and I'm otherwise familiar with the series in passing, but for whatever reason, I had never sat down to watch a Bond movie credits to credits until last Friday. This puts me at a somewhat unique position to talk about Skyfall. I cannot say with any authority that "this is the best Daniel Craig Bond" or otherwise rank any of the Bond films. On the other hand, I'm free to evaluate Skyfall on it's own merits, without any of the trappings of a "fanboy." Skyfall was quite the introduction to the series. James Bond here almost seems to have gone art-house. There's an attention to mood in the film, conveyed though the use of expressionistic lighting and color that simply isn't found in many mainstream action films. While there is indeed plenty of action, the film almost seems uninterested in being "exciting" in the traditional action-adventure kind of way. During fisticuffs in a Shanghai high rise and during the final showdown, the focus of the film isn't so much on where punches land but on abstract color (neon lights and flames at dusk respectively). The nods to iconic James Bond sequences seem fleeting and there as a requisite fan service, rather than what interests the filmmakers the most. A joke is even made about Bond not getting any of the wacky gadgets for which campier entries in the series are known for. The film almost stops any time the lead villain Silva (Javier Bardem) is on screen, especially during one of his several extended monologs. Silva wants not to control the world with some ridiculously convoluted plot, but to get at something much closer to Bond and MI6 boss M (Dame Judi Dench, reprising her long running role). As much as the term can be overused as a vague catch-all, this is indeed a "post-9/11" spy film. The tone is deadly serious, and fears come not from geographically defined enemies, but from rouge actors (read: terrorists). Silva is a computer hacking expert, and with a touch of a button he can bomb buildings and public transit lines alike. Bond in some ways is outmatched by this changing world, a relic of the cold war. There is a tension not only between Bond's old fashioned spy work and his techno-villain, but also between Bond and his changing agency. Not only is Bond surprised at how young gizmo wizard Q is (Ben Whishaw, Cloud Atlas) but he is also confronted by a bureaucrat (Ralph Fiennes, The Constant Gardner) who comes to MI6 with the intention of adding oversight to the beleaguered agency. Skyfall is directed by Sam Mendes, who came to fame with 1999's American Beauty (and simultaneously unleashed the insufferable Ricky Fitts upon the world). 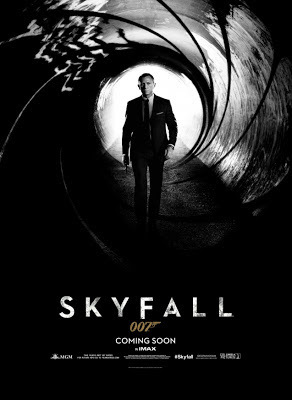 Skyfall was written by Neal Purvis, Robert Wade and John Logan and of course is based on the character created by Ian Flemming. I was impressed by Skyfall, and I'd like to check out some of the previous films, at least the Daniel Craig entries for now. For one of cinema's longest running, ongoing film series, hooking in new viewers like myself means mission accomplished.